Jeremy Corbyn’s leadership offered an end to austerity, a commitment to the public good, the faith that generosity is more powerful than greed. What Kind of a Conservative Is Theresa May? Parliament proved true. The kids took it all in their stride. For the first time in years, I felt less guilty about the mess we’re leaving them. Instead, I felt respect and gratitude to them for stepping up, rejecting cynicism, keeping hope alive. The future is now up for radical revision. Theresa May is still prime minister, trying to form a minority government with the support of Northern Ireland’s ultraconservative Democratic Unionist Party—anti-abortion, homophobic, founded during the Troubles by the firebrand Ulsterman Ian Paisley. But the goatskin vellum on which the queen’s speech will be written remains blank. May herself has signaled that austerity is over. Members of her own Conservative Party are pushing for a soft, consensus-driven Brexit along the lines proposed by Labour. Britain’s political landscape, buckled and riven by the EU referendum, has just gone through another irreversible upheaval—and this time it’s the left that’s surged up through the cracks. A month before the election, it seemed May’s to lose. She called it with a massive 20-point lead in the polls, assuming she’d bury Labour in a landslide. Like David Cameron before her, she misjudged spectacularly. Her campaign was complacent, patronizing, and lazy, a litany of hollow phrases: “Brexit means Brexit,” “strong and stable,” “coalition of chaos.” The first fatal blow was her U-turn on the “dementia tax,” or imposing increased costs on the elderly for their social care; the second was her refusal in the week before the election to risk joining in the party leaders’ televised debate. Even the horrific terrorist attacks in Manchester and London failed to help her cause, despite the received wisdom that fear drives voters rightward, and despite a vitriolic tabloid campaign to smear Labour’s Jeremy Corbyn as a jihadi sympathizer. Labour was quick to point out that the terrorists slipped through the net on May’s watch, aided by her deep cuts to the police force. And President Trump’s ridiculous tweets insulting London’s mayor just as the city came together in shock and solidarity reminded us of May’s unseemly January rush to hold his hand. But all of that would have meant little without Corbyn’s revived, renewed, reanimated Labour Party. Corbyn skeptics everywhere have been gulping down their words; several Blairite big beasts have slunk back to the fold. Corbyn ran a great campaign, with rousing rallies that drew crowds we haven’t seen in decades. On TV, he was confident, authentic, affable. The Labour manifesto promised, without apology, to raise taxes on the wealthiest to restore Britain’s welfare state, including free college tuition—a magnet for the young. Labour’s crucial insight was that the Brexit vote had less to do with Europe than with the state Britain’s in: jobs and dignity lost, communities unraveling, education failing, the National Health Service in tatters, nurses depending on food banks, and homelessness on the rise while the wealthy continue to flourish, oblivious and insulated. 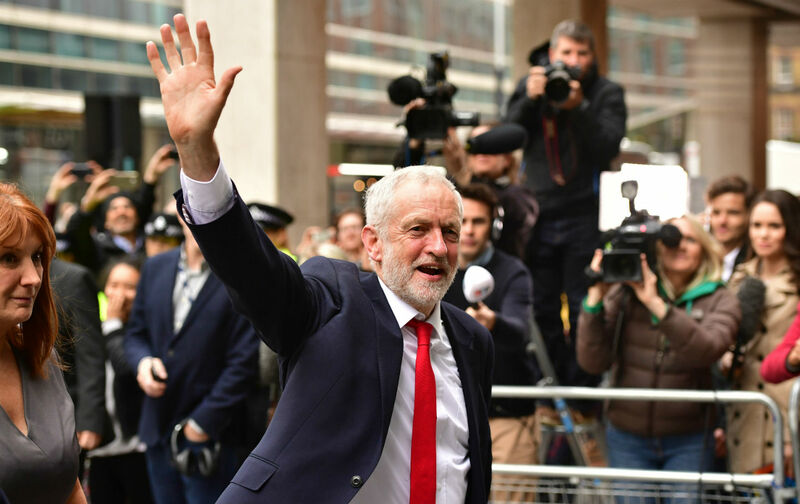 Cameron’s EU referendum asked Britain the wrong question, and Corbyn’s Labour Party offered a different set of answers: an end to austerity, a commitment to the public good, the faith that generosity is more powerful than greed. We had almost come to believe that those things were impossible, written off by history. sington, the country’s richest constituency and one of its most unequal, has also turned Labour red for the first time. Our local Labour MP, who squeaked in the last time by fewer than 1,200 votes, now has a majority of more than 15,000. Conservative pundits on TV are fawning over Corbyn. A pig with wings has appeared over Battersea Power Station. Almost exactly 20 years and a month ago, the morning after Tony Blair’s 1997 landslide victory, I stood with one of those election-night millennials on my hip, talking on the phone with the late writer Daniel Singer in The Nation’s office. He warned me not to put too much hope in Blair’s government: Look what happened in France under Mitterrand. He was right, of course; the years that followed chiseled away much of Labour’s base. But each generation forgets to imagine what its children might do. I never imagined that Labour could move left again after Blair and win a success like this—40 percent of the vote, compared with Blair’s 41. And yet, though Corbyn is 68, with a white beard and a dad’s fashion sense, the young have flocked to him—cheering at Labour rallies, knocking on doors for local Labour candidates. Furious that the old swung the Brexit referendum and stole their future from them, condemned to precarious or temporary jobs and living with their parents, saddled with debt when their lives have barely begun, over a million 18-to-24-year-olds registered to vote this time. Most of them voted Labour. What comes next? No one knows, except that Corbyn is now safe in his position while May has blown her mandate and is no longer safe in hers. There are messy times ahead, and probably another election. May is still promising “certainty”; in fact, there’s chaos looming. Just now, that prospect feels like a relief: the end of a frozen time, an opening to something new.